Pictured here is Jamie Bartholomaus of Foothills accepting his award from Charlie Papazian. Unfortunately, I didn’t have the reflexes to get pictures of any of the other North Carolina winners. Congrats to these breweries! Support North Carolina beer! Free tickets to Biere de Femme! Brew to the Rescue – Results! 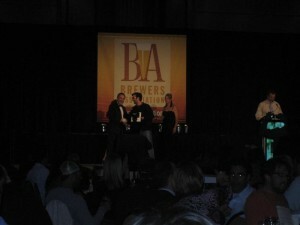 Beer Army Beer Wars: Big Wins for NC!